Common advice on how to lose belly fat by dieting is mostly wrong, even from medical doctors who should know better. Advice generally focuses on restricting calories, which is a dead-end strategy that rarely works. Eating less does not cause fat loss. Losing weight does not equal losing fat. Yes, restricting food intake on a low-calorie diet will lead to weight loss. However, it will include loss of lean body mass – specifically, muscle loss. This is a given. It is rather surprising, therefore, to see the widespread advice from nutritionists, trainers, and even medical doctors, that people should eat less to lose weight. Losing weight is not the goal. Losing fat is. If you want to know how to lose belly fat, simply eating less is bad advice. Your body fat percent increases as you age, even if your weight stays the same! Scientists have discovered a range of body fat percentages that they recommend for optimum health. The numbers show a steady increase, even when people are healthy – i.e., not overweight. The numbers are always higher for women than for men, and they increase with age. These are the target ranges for good health. It is probably obvious that being above these ranges is the foundation for overweight (i.e., overfat) and obesity. There may be no limit to how high it can go. One of my clients, a woman in her 50s, measured at 48 percent body fat. Wow! As a first example, let’s start with a healthy man, aged 42, who eats according to all the dogmatic advice on what is good for human health. He keeps his weight steady over the years at about 180 lbs. If his body fat composition in his 20s was 15 percent, in his 40s and 50s it will probably increase to 18 percent, and in his sixties it will continue to crawl upward past 20 percent. Remember: He is healthy and maintaining ideal weight. In the second example, his high school buddy, who at one time was about the same size, has ballooned to 250 lbs. and 33 percent body fat. Regardless of what he did to get into that predicament, think about what might happen if he suddenly began eating the same diet – i.e., amount, quality, frequency – of his healthy buddy: Nothing! The ‘healthy’ buddy is already increasing his body fat composition on this diet! By the time the overweight friend peaked out at 250 lbs. (so far), his body had already become already insulin resistant (pre-diabetic), leptin resistant (not responding to his own master fat hormone), estrogen dominant (fat cells making estrogen), and growth hormone deficient. He had become overfat, no longer healthy, and had begun suffering from multiple hormone imbalances. Suggesting that he diet by restricting calories, especially by going ‘low-fat’, is the worst possible strategy for returning to his ideal weight and body fat composition. All it will do is lower his metabolic rate, cause loss of lean body mass, make him frequently hungry, and put him into a never-ending downward spiral of eating less and less to keep his weight down. If he sticks with it long enough, he will jeopardize his health in numerous ways. More than likely, he will not stick with it and will gain rebound weight with a vengeance. Eating right, of course, is a good foundation. Without it, other strategies will either not work very well or not work at all. When you understand that hormone imbalance is the biggest obstacle, then addressing this issue is the most important step. The obvious challenges, of course, are to know what ‘eating right’ really means and to know how to boost the hormones that should be working for you instead of against you. Oh, and by the way, when you do what it takes to improve your hormone balance, you might be surprised that your body fat percent does not climb as you age. In fact, the ‘norms’ in the tables above are only accepted as such because that is what our ‘healthy’ population variation shows. This is a bit of circular reasoning. The reality is that your body composition doesn’t have to change at all as you age. All the possible strategies on how to burn belly fat add up to a lot of information to digest at once (pardon the pun). It is way too much information to include in a simple blog post like this one. In fact, it is enough to make a whole book, which I have done. If you are really interested in seeing what you can and should do to reduce excess fat, take a look at the table of contents here: Belly Fat Book, then ask me for a free copy. 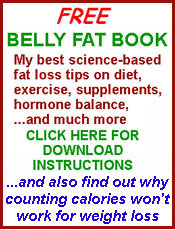 I think it has some great advice on how to lose belly fat. Maybe I am biased, though, since I wrote it!